The lack of puzzles is due to the fact that the puzzle addressed in book 1 is solved in book 1 and the problems posed in [chapter 12] declare themselves to have "no rational answer". This is the information equilibrium relationship (W/P) : Y ⇄ L where Y is real output, W is nominal wage, P is the price level and L is the labor supply. The second postulate could be tackled in terms of the information equilibrium take on utility. The other relationships can be understood in terms of the information equilibrium IS-LM model. I will eventually try to put together the whole of Book 1 in terms of information equilibrium. Chapter 12, on the other hand, is non-ideal information transfer. As Waldmann put it "Keynes wrote that there will be manias, panics, and crashes no matter what policy makers do ...". I find it interesting that what Keynes was discussing in Chapter 12 is the state of long-term expectation and that one way to think about deviations from information equilibrium is as expectations with varying degrees of accuracy. 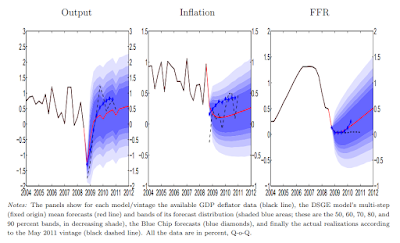 In general, non-ideal information transfer gives us a way to look at various economic shocks. Since it is not information equilibrium (from which we could see rational agents as emergent as long as we stay near equilibrium), non-ideal information transfer represents (as Krugman says above) "radical uncertainty for which there is no rational answer". There may eventually be an answer, but it will come from psychology and sociology. The information transfer framework allows us to join together Krugman's "Book 1 Keynesians" and his "Chapter 12 Keynesians" in a coherent whole. Both are 'correct' (at least in terms of the IT framework) -- under the right conditions. thanks for the link and for "(a very good post)"